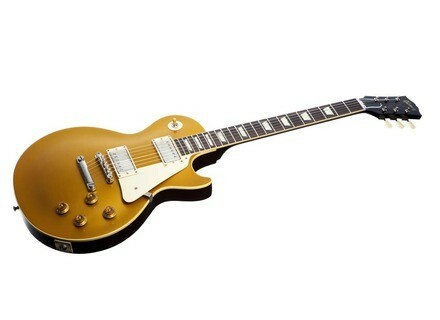 Along with the Les Paul Standard, the Gibson Custom Shop reissues two 1956 and 1957 Les Paul Goldtop. Both Gibson Custom Shop 1957 and 1956 Les Paul Goldtop have a mahogany body, a maple top, a set-in mahogany neck with long tenon and a one-piece rosewood fingerboard. Like the other 2013 Custom Shop Reissues, both guitars received some new features, including Kluson Deluxe tuners and two PAF-inspired Custom Bucker pickups on the 1957 version. The 1956 edition is equipped with two P-90 single coil pickups with Alnico V magnets. You'll also find on these guitars two volume and two tone controls, as well as a 3-way pickup switch. Regarding the finish, the 1956 Goldtop Reissue is available in Antique Gold VOS, while you can choose between the Antique Gold VOS, Antique Gold Darkback VOS and Antique Gold Gloss finishes for the 1957 Goldtop Reissue. Both instruments ship with a flight case.